I have wanted to paint our house since the day we bought it. In fact, I think it was one of my terms of approval - I made Carter promise we would paint it soon after moving in. Well, three years later, it's still not painted. But I swear, with the vehemence of Scarlett O'Hara, that this will be the summer! We almost pulled the trigger last summer, but someone (Carter) dragged his feet and then we lost momentum. The plan is to have the trim and siding of the house painted professionally while Carter tackles the brick. Our house is a small cape-code style brick and siding combo....and unpainted, it's nothing special from the outside. But painted? Our house could be straight-up adorable and that's my goal. I love this little guy...such a quaint place to call home and I hope our painted house will have similar charm. I like the whisper of green in the paint color and LOVE the Chippendale railings. Our front steps currently have a metal railing and replacing it with this type of white railing would make me incredibly happy. I love a small home with various nooks and crannies to it. I'm not sure this is the green color I'm going for, but I like how the white trim popped against this shade. And I desperately want that back patio. Sooo fetching, right? I guess this paint color leans more toward taupe, but I thought it could work with more green in it. 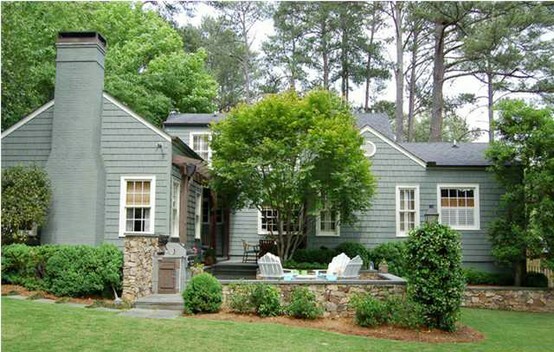 And I love the pop of white trim and that cedar shingle detail! I don't think our house has a spot that would work with shingles, but if it did, I would totally do this. It adds a lovely dimension to a smaller home. 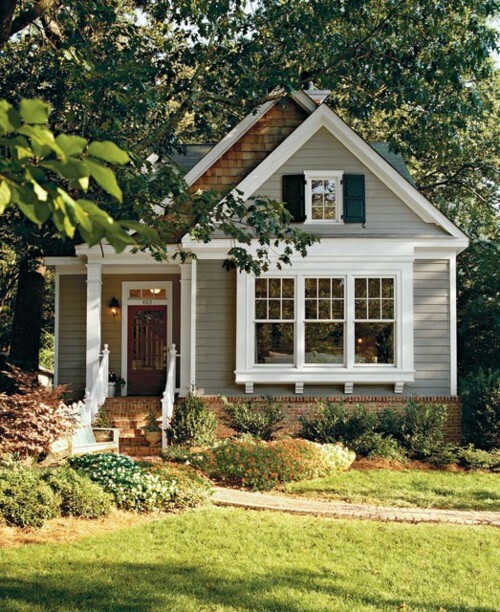 Have you guys seen any cute homes that have been painted green? I have a small collection on Pinterest, but if you have a good lead, let me know! OH and dont forget to check out our GIVEAWAY today!! It is not paint, but it is saying "hello" to me! I love this Tea House Lantern and also Lightfoot House in Quartz, I never met a lantern fabric I didn't love. I don't think you could do better than the first little bungalow. It is very old Virginia with a timeless feel. Montecello-esque if you will and the pop of a red door will keep it freshly modern. Isn't it amazing what a little chippendale can do? My husband's from Charlottesville and I love all the old homes, especially Ashlawn. Husband was kind enough to point out that I had spelled Monticello ... I knew there was a reason I married the fellow! I went to UVa, and didn't catch it myself. Shame on me :) I agree that the chippendale railings are very Virginia and Jeffersonian, which is why I want them! Both Carter and I are UVa grads and count Charlottesville among our favorite places on earth. We painted our Cape Cod last summer. Gray, white and black. Not an easy job but well worth it. Good luck! Can't wait to see how it turns out. My house near Richmond, is green (BM-Gloucester Sage) with mostly white trim (and a little taupe(BM-Abbington Putty-in places). We also have lots of white Chippendale railings on the porches and all around the deck! So I like your thinking!Do it!